This page is aimed at staff and students using eduroam® facilities while visiting other participating organisations. Visitors to Western Sydney University intending to use eduroam® should use the visitors page. eduroam® is a TERENA registered trademark, and an abbreviation of educational roaming. Members of participating organisations worldwide are able to securely and wirelessly access the Internet using their regular wireless login credentials while visiting any other participating organisation. You will no longer need to obtain a guest user account when you visit participating organisations. The University connects to eduroam® via the Australian Academic Research Network(opens in a new window) (AARNet). University eduroam® users will use their WesternAccount credentials to login when they visit participating organisations. How do I get access to eduroam®? Access to eduroam® is available to all staff and students with an active WesternAccount. Conditions apply. Your password will be your regular WesternAccount password. Plan ahead: More information will be available on the visited organisation's website, including advice on configuration settings that may be required for Internet access at that organisation. Where can I use eduroam®? eduroam® is available to staff and students at participating organisations worldwide. Visit the eduroam® website(opens in a new window) for maps showing participating organisations. Australian and New Zealand site information may be found at the wiki for end users. (opens in a new window) There is an iPhone application eduroam companion (opens in a new window) that will allow you to locate eduroam sites worldwide. What can I do with eduroam®? You should be able to access web services (HTTP and HTTPS protocols) and email (POP3, IMAP and SMTP protocols). The visited organisation may offer additional services. 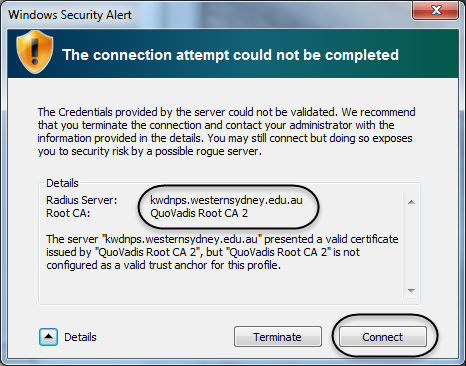 Note: If you are a Western Sydney user and try to use Eduroam on a Western Sydney university site you will NOT have full access to all University services. Please use Western Wifi if you are on a WSU campus. eduroam® uses the most secure encryption and authentication standards available. If the dialogue box similar to the following appears, select Connect to continue. It is most important that you check the information regarding eduroam® at the institutions you are going to visit, as this may provide other vital configuration settings that you will need to be able to access University systems and the Internet from that institution. This is likely to include configuration settings for your wireless adapter, and proxy settings required within your web browser and other network software. The first point of support for University eduroam® users is this web page and associated information. Our MyIT knowledge base (opens in a new window) may also be able to help. Further information will be available on the visited organisation's eduroam® web pages. eduroam® users should review the web based information before contacting the local support service for assistance. All use of information technology systems at Western Sydney University is governed by local laws, the IT Acceptable Use of Resources Policy and other relevant University policies. Visitors using eduroam® must also abide by their home institution's policies. In the event of any conflict between policies, the most restrictive will apply. In accordance with various University policies, all use of IT systems is logged and such logs may be subpoenaed as evidence or used for other investigative purposes. eduroam® Internet access is not filtered. Use of eduroam® is restricted to persons over 18.